Please DO NOT Purchase this product for demonstrating pumping of blood in heart. 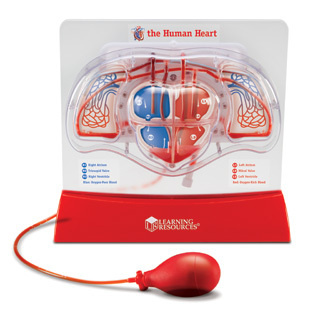 You may use it just to show a 3D diagram of heart and lungs connection_ but the pumping model does not show the difference in oxygenated and de-oxygenated blood nor does it show how the blood is pumped from one chamber to another and then to the lungs and back accurately (not even remotely accurate). The simulated blood (red-colored water) just flows erratically with NO resemblance to how a heart pumps blood. I wonder who designed, tested and recommended this product! Or just drink heavily once a week and go act out. Good luck! I guess this is what I missed and so had to have open heart surgery. Oh well,my heart was pumping simulated blood. That must have been it. Now a pig does the job of the pump!